This is the 3rd in our series of posts about our trip to the Philippines. Check out #1 here and #2 here if you’re interested in the first two installments. Aside from spending quality time with family, we also sneaked out to have some outdoor fun with my longtime hometown friends. A favorite pastime during our visit was to show up at a friend’s house where we would sit, talk, laugh and eat all day long – forgetting about time as we can only do while in my country. Anyhow, I am proud that my hometown has one of the best scuba diving areas in the Philippines, and according to many of the divers there, some sites are world-class. That’s why Steve selected Moalboal as his place to get certified during our trip in 2009. Although he hadn’t dived since then, he was excited to get back out there on this trip to enjoy the beauty – after taking a “refresher” dive off the beach at the resort where he stayed for 2 nights. It’s quite ironic that an island girl like me who grew up here has never seen and experienced the beauty below the surface of the sea. But Steve and Stan dove together several times; Stan is a very experienced diver, and Steve was happy to tag along as his partner on their adventures. Judging by their big smiles and excited talks afterward, a good time was had by all! Steve assured me that this is exactly what it’s like there, although they didn’t encounter the “clouds” of sardines swimming around on this dive as he did in 2009. But what a fantastic adventure! On another day we took an early morning walk with Stan and Gigi, but halfway through a sudden rain storm hit us. Although the rain felt good, we didn’t want to get drenched. We were happy when Gigi asked a lady along the road if she could spare some banana tree leaves for us to use as umbrellas. We showed our husbands how we dealt with rain storms in the days when we didn’t have such luxuries – they were impressed! And viola, we have instant umbrellas! The rain did not let up after we donned our new rain gear, so we took shelter near a school to wait it out. When it was apparent that the storm was going to last for a while, we were finally able to flag down one of the ubiquitous “pedicabs” that service the areas around town. As I explained to Steve, in the Phlippines a pedicab is a motorcycle-propelled cab that holds up to 4 passengers or more and the driver. A “trisikad” is the same except the propulsion is via a bicycle. You don’t want to get stuck behind a trisikad when you’re driving through town! Just another day in the Philippines! Isn’t it obvious that Steve loved riding around in these things? Near Moalboal is a big tourist draw, the Kawasan Falls. It’s only a 30-minute drive from home, but believe it or not I had never been there. Because of my ultra-strict mother, I was a sheltered child (cue violin music here) and not allowed to go anywhere she thought danger lurked – and swimming at the falls was one of them. Although she gave her blessing this time, she didn’t fail to offer us many warnings about what not to do while there. At 96 she is still very protective. The walking bridge had been destroyed during the typhoon “Quennie” we endured on our first day here, so we had to walk with a guide across this hazardous passage. Good thing mom didn’t know about this! The waterfall consists of three tiers, but we were told by the locals at the gate that we could not go above the lower falls. The recent typhoon had washed away foot bridges and trails, and we had to have a guide to get us out there. Due to the recent heavy rains, the waterfall was gushing with beautiful clear water. Stan, Gigi, me and Steve – look mom, we survived! Along with all the fun was a little business I had to take care of. On Facebook I led a group of Moalboalanons to take on a small project in our town. Thanks to FB, our membership is global. We mostly chat on Facebook or use Skype for our meetings. Since I had not met most of them, this visit was my chance to meet, in person, the active members who were doing a lot of our project’s work. We have had limited success on our initial project, but we’re looking forward to doing more good things for our little town. 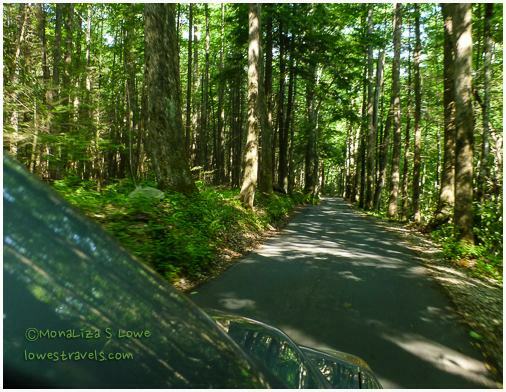 There was lots more to do at the Great Smoky Mountains National Park – more than I could fit into a single post. I have to say that despite going through and around the Smokies for the 10 days we were there, we barely scratched the surface. 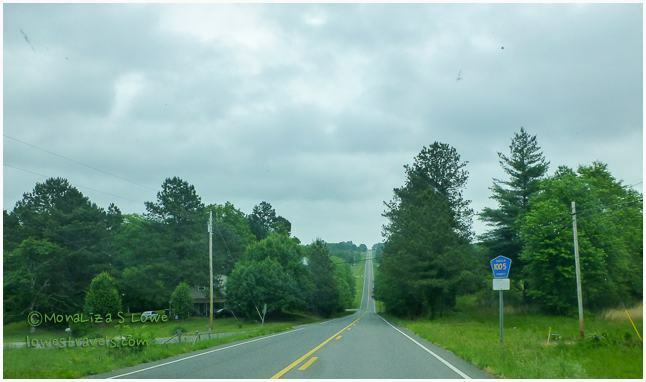 We were based near the town of Cherokee, about 5 miles from the south entrance to the park. This turned out to be a long post, so grab your favorite beverage and take your time checking out our adventures at GSMNP. A visit to the Museum of the Cherokee Indians enlightened me about the plight of the Cherokee Indians in the early 1800’s. My take away from perusing through cultural and historical displays was that the Cherokee people who live in North Carolina today are referred to as the “Eastern Band of Cherokee Indians.” They are the direct descendants of those who avoided the Cherokee’s forced removal to Oklahoma in the 1830’s, also called the “Trail of Tears.” The 56,000-acre Qualla Boundary in western North Carolina adjacent to the Great Smoky Mountains National Park is their current home. We did not encounter any live bears during our stay, but I was happy to see these critters around Cherokee that seemed harmless enough. On the same day around the corner from the museum building, a Gourd Festival was in progress. I was curious, since this was the first time I had heard about this kind of festival. I saw gourds of various sizes, shapes and odd forms for sale. Crafters and gourd enthusiasts crowded the area, displaying their works of art or attending activities like hands-on gourd crafting. I was fascinated with the details and craftsmanship of the finished gourd art on display. OK, which trail are we taking? 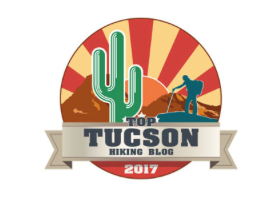 Lets talk hiking. 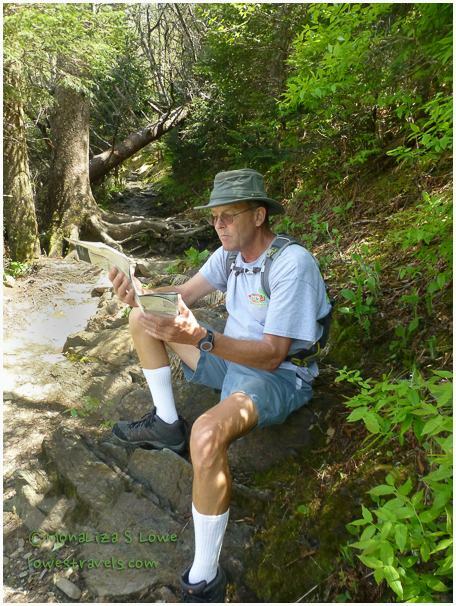 I understand now why the GSMNP is also called, a “hiker’s park”. As we drove through on US 441, the main north to south scenic highway, we noticed many trailhead markers along the way. With about 150 hiking trails to choose from, we were in hiking heaven! We’d been longing for some more challenging hikes with serious elevation changes, and we weren’t disappointed here. The hikes we chose took us deep into the forestlands. Some included breathtaking views, several ran along rushing streams with cascading waterfalls, and most were adorned with millions of wildflowers that made me stop frequently for photos. 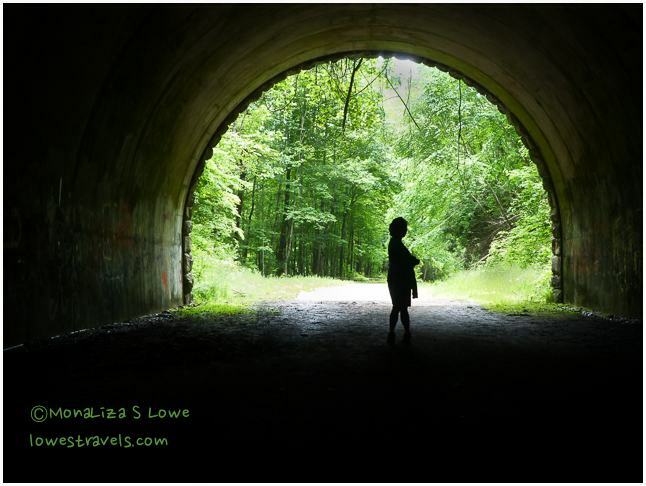 We categorized our hikes as either waterfall, vista or wildflower hikes. Below are details of just a few of the ones we chose, and we went out almost every day to explore until our legs throbbed in pain! Waterfalls, streams and rivers abound in and around the park. 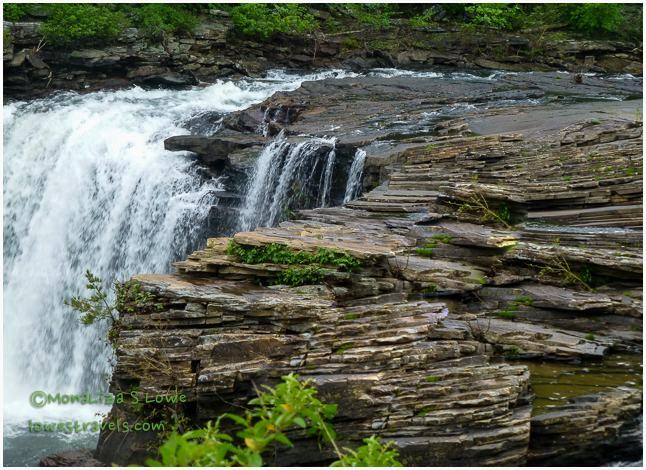 I learned that many parts of the Smokies receive over 85″ of rainfall on average each year. All of that water trickles and then rushes down the mountainside, creating multiple waterfalls, streams and rivers. We loved the hikes that let us enjoy the sounds of water along most of their length. It is so green and lush everywhere. 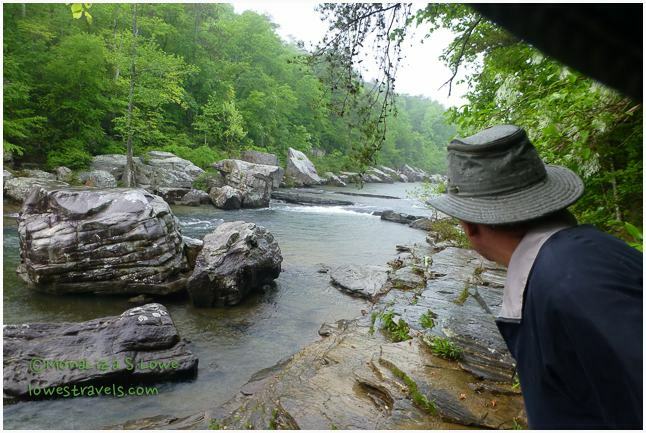 Following a three-waterfall loop from Bryson City, we came upon the Juney Whank, Indian Creek and Tom Branch falls. How often do you get to see three beautiful waterfalls on one hike? 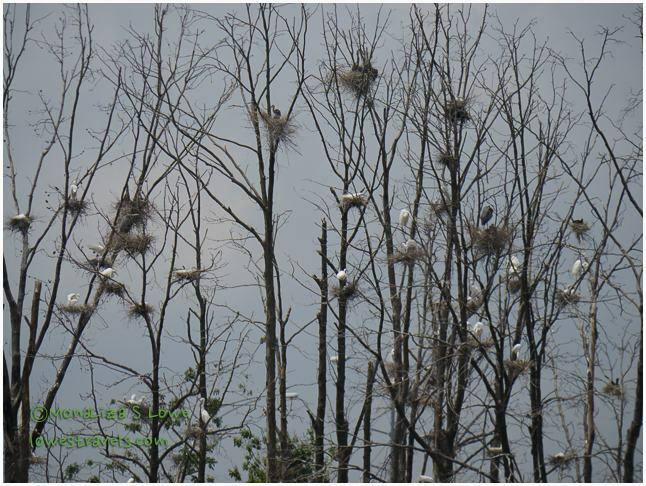 We also saw several others along our driving route that day. To reach Mingo Falls, we followed a 0.4 mile trail that included steep wooden stairs, and we were out of breath by the time we reached the top. 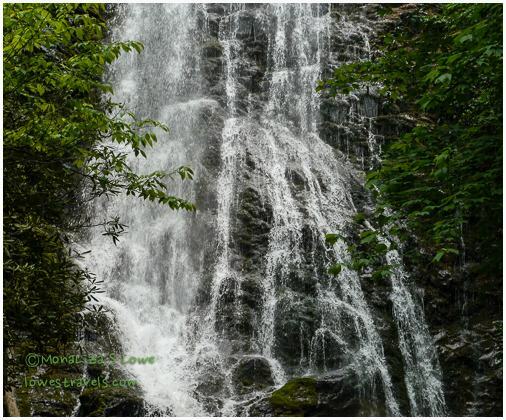 At 120′ tall, this is one of the tallest and most spectacular waterfalls in the Smoky Mountains. The hike to Abram Falls was about five miles roundtrip. The waterfall itself was only 20′ high, but a long and deep pool at its base creates strong currents beneath the falls. The strong undertow there was responsible for the deaths of several people. 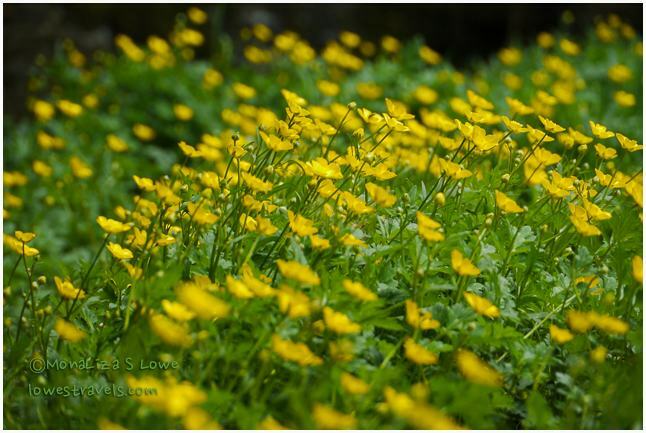 The Smokies explode with wildflowers during the springtime months. It is commonly referred to as “The Wildflower National Park.” But alas, we missed many of the beauties by arriving a bit late in the season. The best time to see the hillsides carpeted with colors is April and May, but I managed to snap a few leftovers on some of the trails where the wildflowers were abundant. 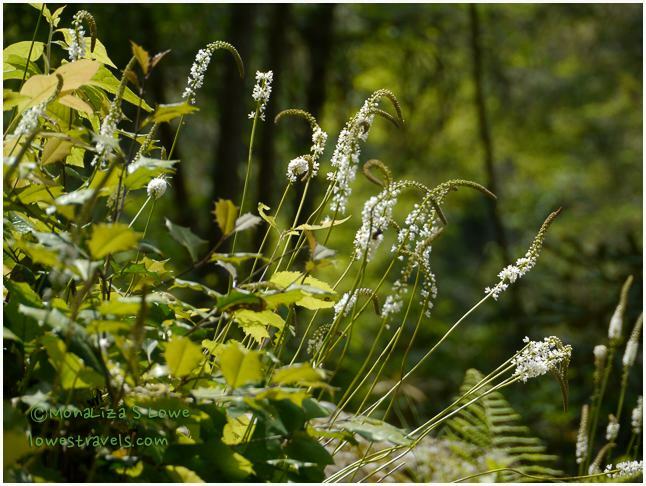 To catch a few of those remaining spring wildflowers, we followed the Oconaluftee River Trail, an easy 3-mile roundtrip that began at the Oconaluftee Visitor Center and ran alongside the river. 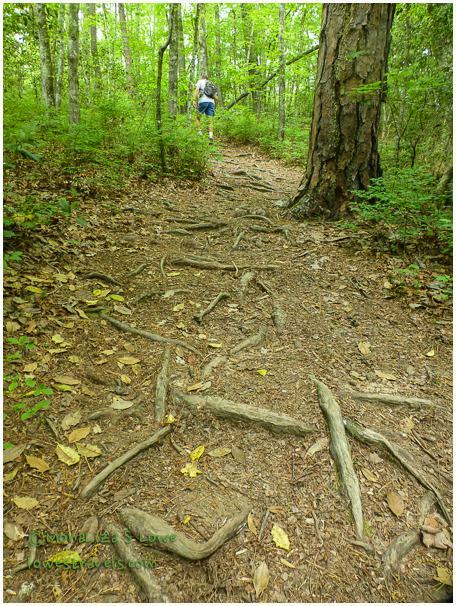 Next, we followed the 6.2-mile Smokemont Loop Trail and burned some calories on its 1,400′ ascent through creekside cove hardwood forests and drier oak- and hickory-dominated ridge tops. I was able to see a few blooms and can identify only a few and marked some with a (?). The Icewater Shelter Trail (5.4 miles) was our first true taste of serious mountain hiking, since this trail ascends quite steeply at the beginning. Parts of it are very rocky with large boulders, and other sections follow smoother ridge lines. 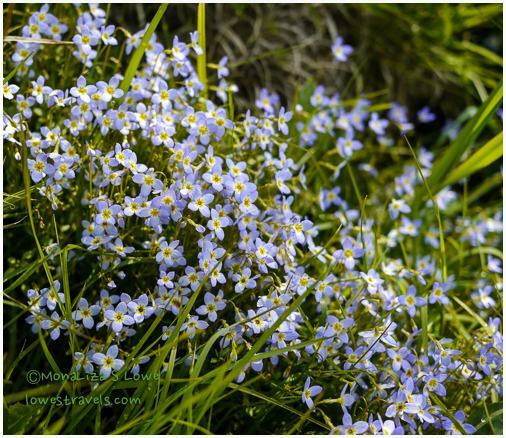 A few clamps of Bluets were swaying in the breeze along this trail. 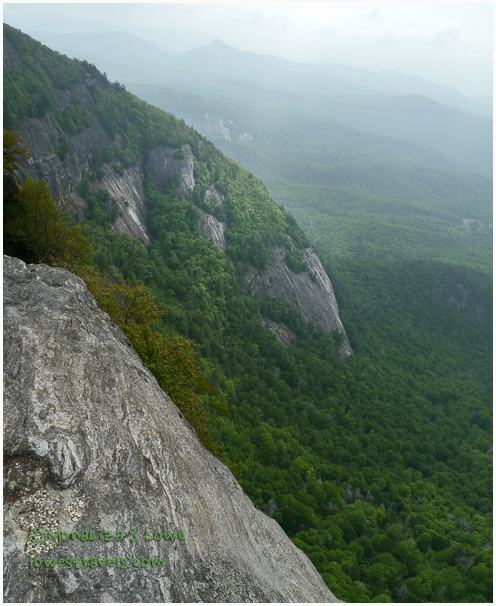 It is a section of the Appalachian Trail that goes to the outcropping at Charles Bunion. The vista hikes we did were real “lung busters” and calf toners, with rewards of great panoramic mountain views. The .5-mile ascent to Clingman’s Dome, which I mentioned on my previous post, gave us a 360-degree view of the Smokies. Outside the park we tackled Whiteside Mountain in the Nantahala Forest. This mountain is a distinct landmark along the eastern Continental Divide for aviators and ground-bound folks alike. 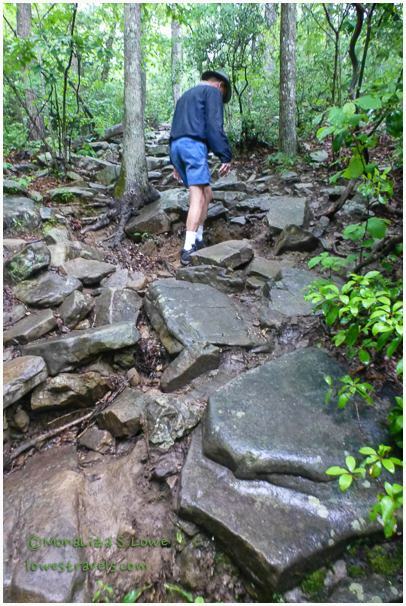 The 2-mile trail is rated difficult because of its steepness and switchbacks, which include steps placed to help negotiate the rocky slope. At the top we had a great view of South Carolina and the face of this mountain, which is prized by rock climbers. It was closed to those folks while we were there because it was nesting season for the Perigrine Falcons that return there every year. 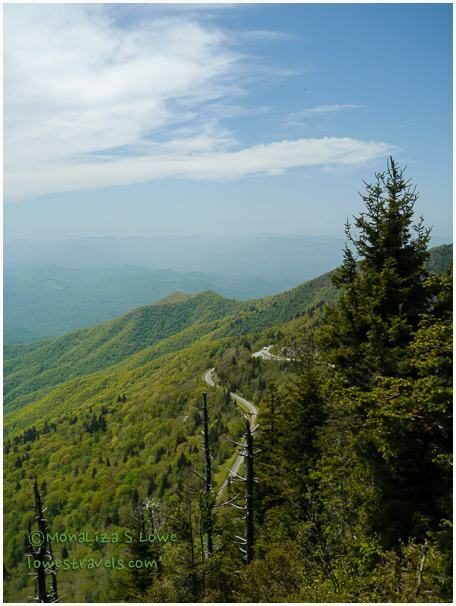 A 1.2-mile roundtrip hike to the summit at Waterrock Knob was a steep climb, gaining 412 feet in elevation. 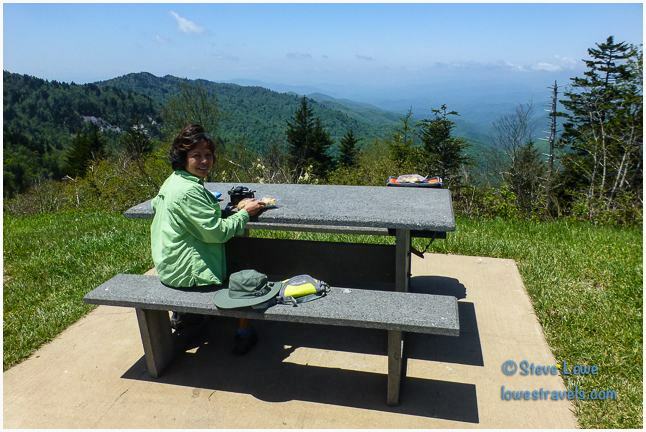 This trail begins at Milepost 451.2 on the Blue Ridge Parkway, just 18 miles from where the parkway ends at the Great Smoky Mountains Visitors Center (Milepost 469). After completing all of these hikes, we believe the calories we’d been carrying since leaving Florida were finally melting away, and our hiking muscles were coming back – yay! But most of all, we felt really good and reinvigorated from being back to nature and far from the noises of civilization. Maybe wearing green for pictures isn’t such a good idea out here? 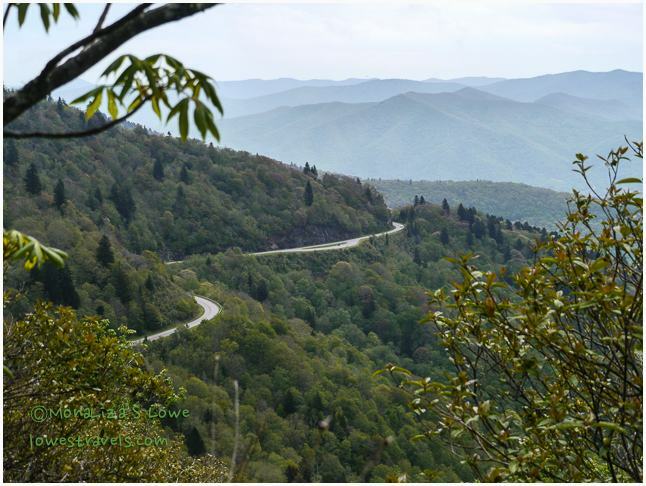 Although hiking might be the best way to enjoy the park, scenic drives are also available to those who prefer to view the mountains from the comfort of their car. 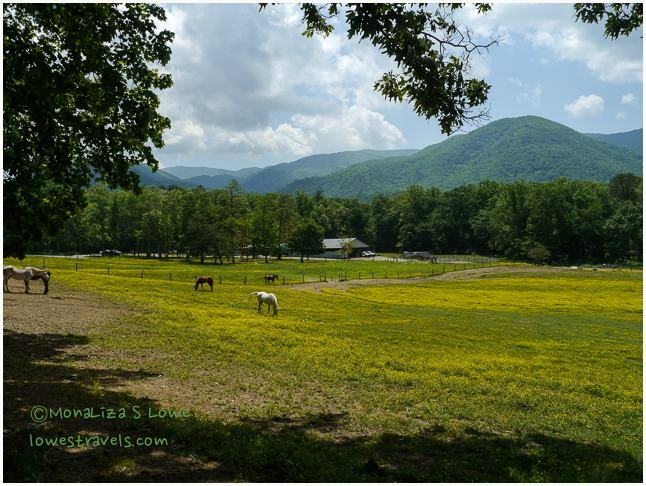 In between our hiking days we took the suggested drives to Cade’s Cove Loop and the Roaring Fork Motor Nature Trail, which were about 56 miles from our home base in Cherokee. We also checked out the nearby Road to Nowhere in Bryson City. 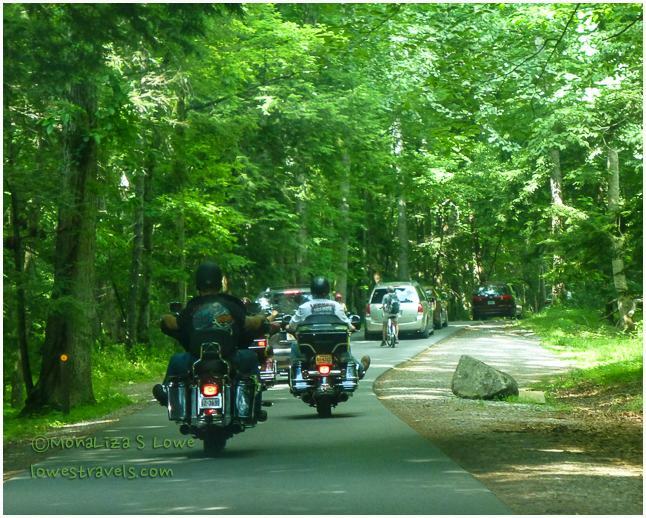 The most popular drive, with bumper-to-bumper traffic on a one-lane 11-mile loop road, was Cade’s Cove. A “cove” in the mountains is a flat valley between mountains or ridges. 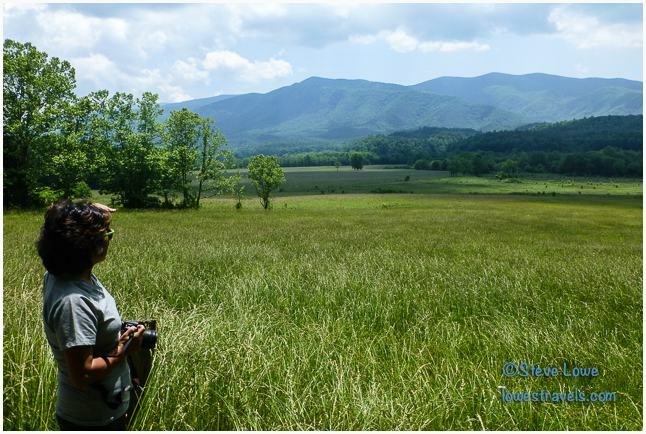 Cades Cove used to be a farming community in the early 1900’s, and today this is a showcase of natural and cultural treasures preserved for generations to come. As we drove here, we saw preserved pastureland, churches, preserved structures and some wildlife. 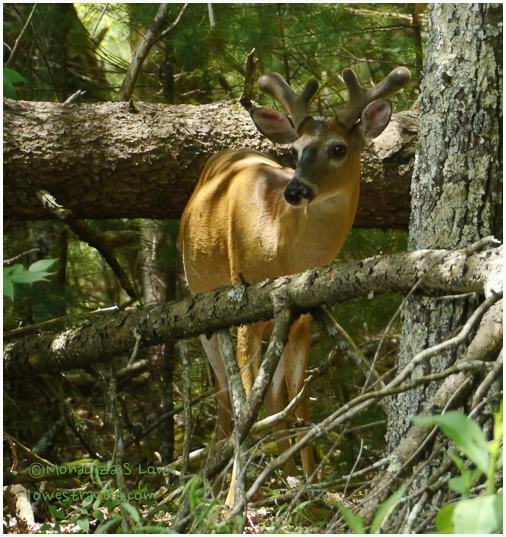 We never saw a bear, but this cute deer caused a traffic jam on the one-way street. As the name suggests, the Roaring Form Motor Nature Trail is a nature trail viewable from your car. As we drove the 6-mile-long, one-way loop road we were essentially following Roaring Fork Creek, a stream within a series of rushing cascades. There were access points to waterfall trails, but we just drove on the road enjoying the forest. The beautiful green scenery and sounds of rushing water was so soothing that I was afraid Steve would fall asleep while driving. Did I mention that it’s very green out here? 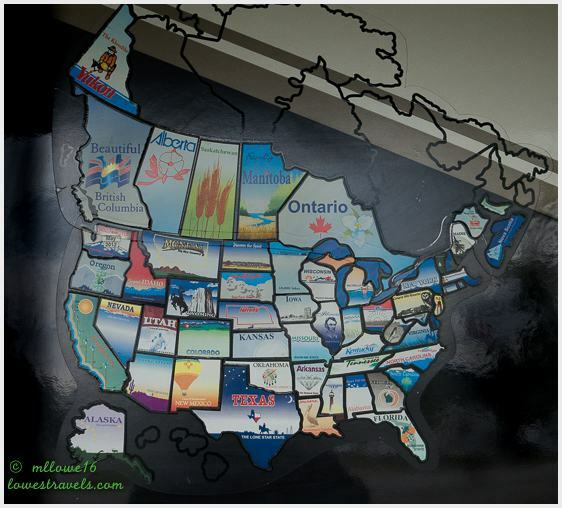 We learned about this drive from the packet of “Off the Beaten Path” information that our RV park hostess gave us. 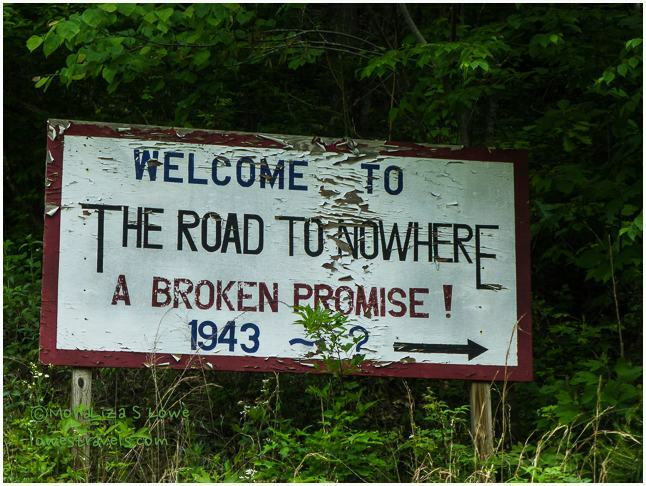 The road was originally named Lakeview Drive, but since it was never completed the residents called it “The Road to Nowhere.” In 1943 the federal government promised to build it for access to the Fontana Dam, as compensation to local residents who gave up their land for the project. Approximated 6 miles of the road, including a bridge and 1200-foot tunnel, were completed by end of 1969, but the remaining 26 miles was never finished. 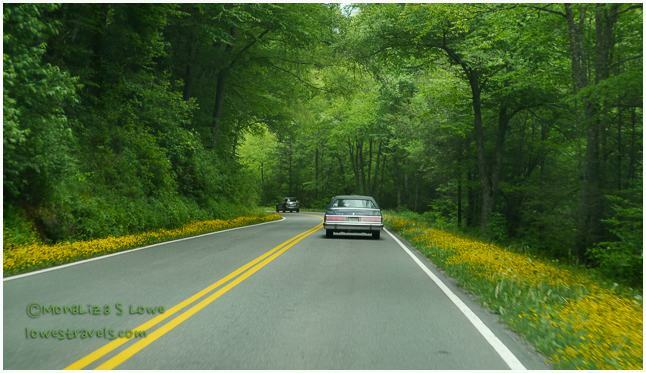 It is a nice scenic drive from Bryson City into GSMNP, where it dead-ends. 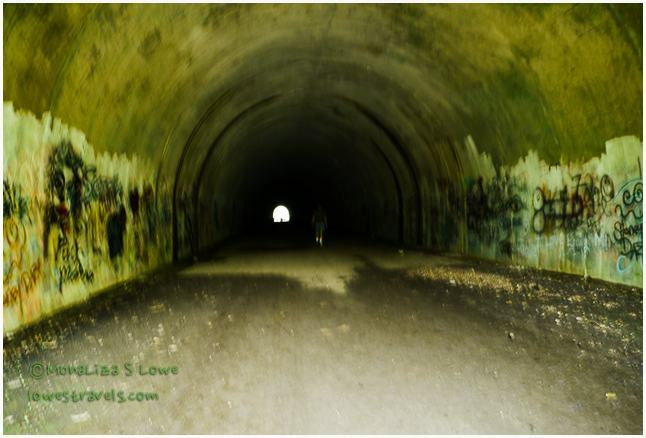 Walking through the dark 1,200 foot tunnel was a bit creepy. The tunnel is closed to car traffic and can only be walked through on foot. Midway through it, I grabbed Steve’s hand as it was a bit scary walking in the dark – even though we could see light at the distant end. While walking around Bryson City we stumbled upon a local brewery – a perfect way to end our long day of auto touring. 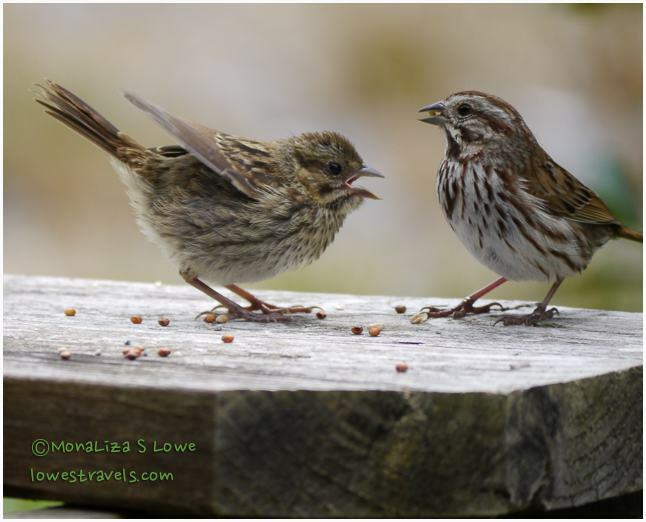 Back at the campground, our feathered friends provided us with entertainment as we relaxed after each long day in the mountains. And that wraps up our magnificent and glorious stay at the mountains. 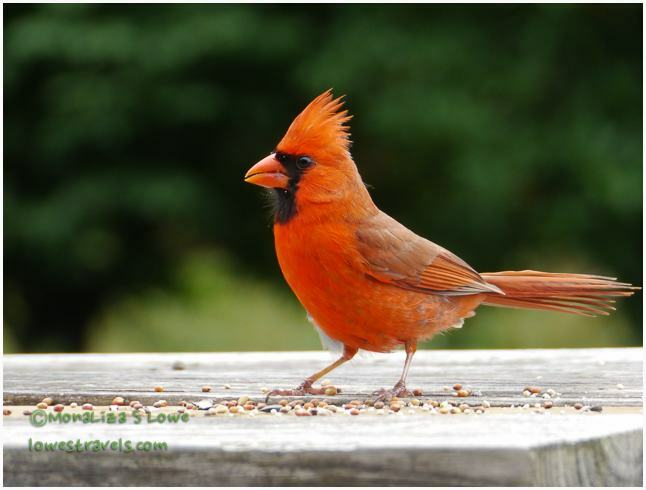 We feel that we made the most of our time with a close-up experience of the best, nature has to offer in the Smokies. 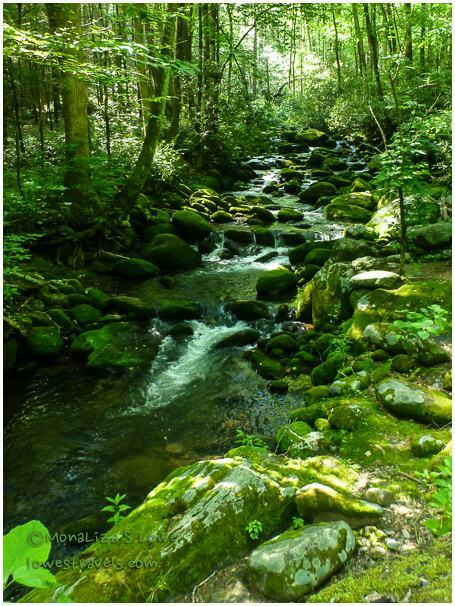 For more information, visit The Great Smoky Mountain National Park’s Website! With our urban meanderings out of the way for a while, we set our eyes on what Reader’s Digest called “One of America’s scenic drives,” the Lookout Mountain Scenic Parkway. It’s 93 miles long and spans three states as it stretches from Gadsden, Alabama, through the northwest corner of Georgia to Chattanooga, Tennessee. 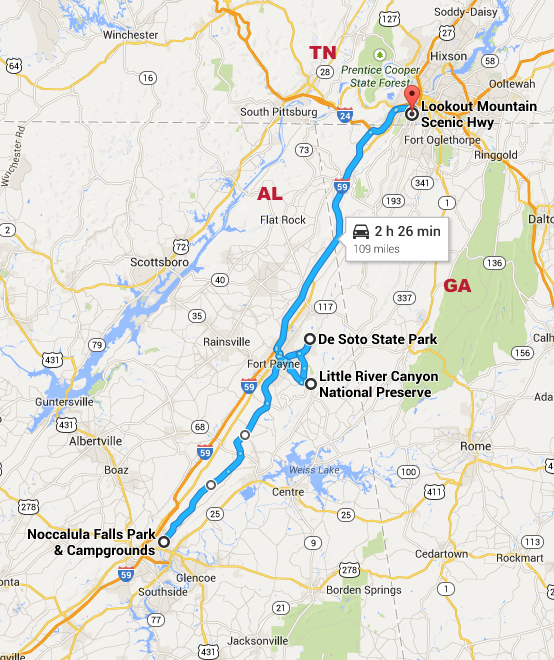 Lucky for us the the parkway begins right where we’re currently located, at Noccalula Falls Campground in Gadsden. Because rain was forecast for later in the day, we set out early with map in hand, planning to drive as far as Desoto State Park in Mentone, Alabama. After having lunch there we would wind through small towns, climbing several grades to see the lush and green scenery. On the Parkway we expected to see waterfalls, canyons, unique towns and villages, state and national parks and preserves. Although it was an overcast day, we were hoping to avoid the rain long enough to see and capture some beautiful waterfall pictures. Although rain clouds were hovering, like the cows we must continue on our mission! 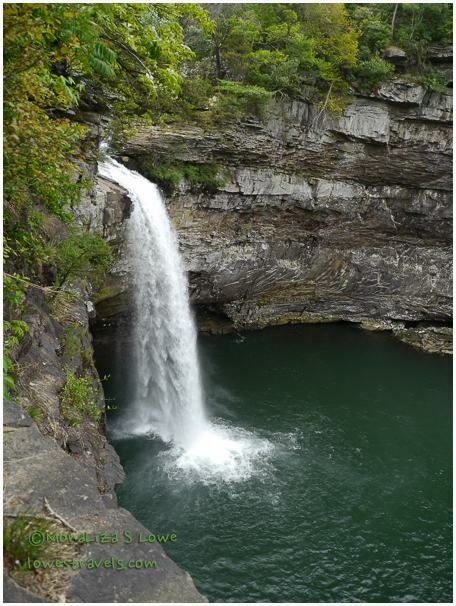 Our first stop was at DeSoto State Park, where the water of DeSoto Falls plunges 120 feet into the river below. The highest falls in the area, it was named for the spaniard Hernando DeSoto, who searched unsuccessfully for gold nearby. Upon arriving and parking there, the first thing we saw was a lovely reservoir situated above the falls. The state park featured miles of hiking trails, so we had to take some time to pick our favorite candidates. The first one had several intersecting trails with the sound of water rushing through streams along much of its length. It was also very fragrant with the smell of many wildflowers – the best-smelling trail we can remember! Although not very strenuous, we felt like this was the first real hiking environment we’ve been in for many months, and we were glad we had brought lunch along so we could spend as much time as possible in its beauty. 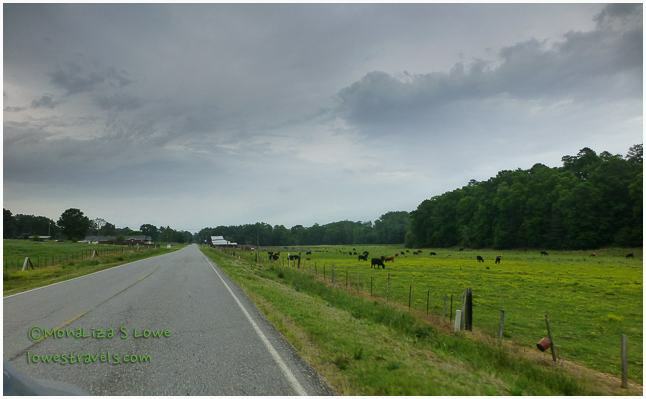 By the time we got to Little River Canyon Preserve, the sky had already darkened and we felt some raindrops. We forged on and discovered that Little River is a mountaintop river that plunges into a nature sanctuary. It’s one of the nations’s longest rivers that forms and flows for most of its length on top of a mountain. 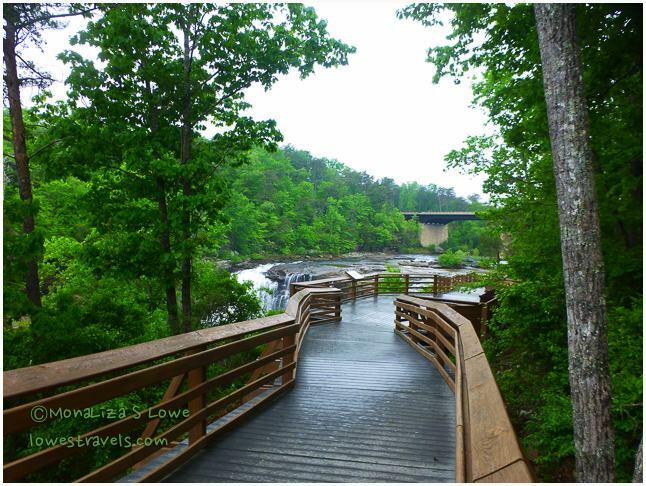 There is a boardwalk that leads to the Little River Falls lookout. 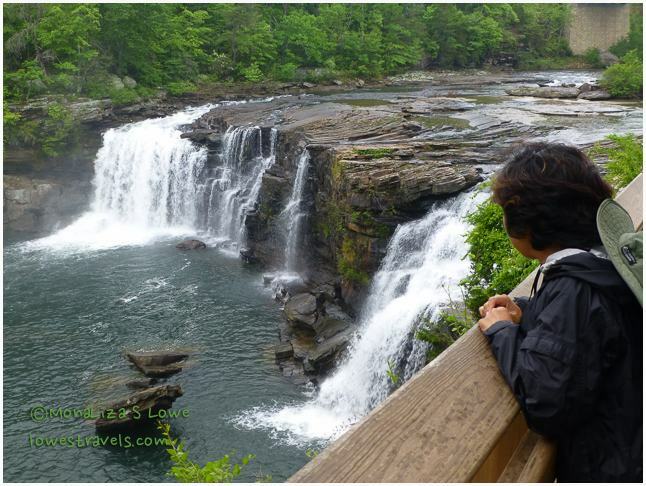 Little River Falls – actually it’s not so little! Uh-oh, being lost is what’s really on our mind! We had intended to follow the 11-mile scenic drive along Canyon Rim Drive to view more of the river and canyon scenery. Alas, it did not work out, as we somehow missed a turn and didn’t realize our error until it was getting too late to backtrack. 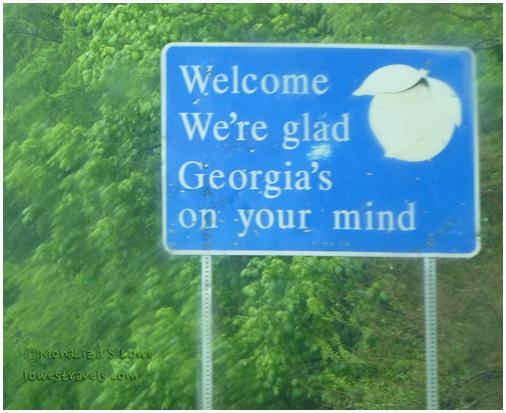 Seeing the “Welcome to Georgia” sign was the first hint that we were lost. 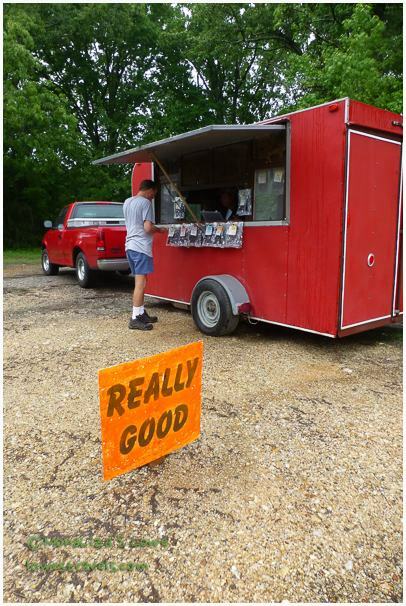 But there was a silver lining after all – Steve saw a roadside jerky stand and we stopped there to get directions. While talking, we tasted several of Tony’s excellent jerkies and ended up buying two bags. I discovered that Steve just can’t be upset about being lost when he’s chewing on a good piece of jerky! Must be really good, it says so right there! “Tony the jerky guy” confirmed we were several miles off course, and that going back to complete the Canyon Rim Drive would have gotten us home pretty late. So, we started back on the more direct route and after a while Steve spotted a pickle store. Well, the only thing he likes as much as a good piece of jerky is a good dill pickle, and we had never before seen a store dedicated to pickles. We stopped to taste the array of spiced pickles and other products. The owner/pickle maker told us the story of how the business began, and how she discovered that her products are very popular among southerners. Forty dollars later (pickles, olives, tomato/mozzarella salad and roasted peanuts) we walked out with big smiles. And that’s how our trip to the Lookout Mountain Parkway ended – we missed part of the scenic drive, but got enough yummy munchies to last a while in return. Life is funny! She makes great pickles – behave yourself, Steve! 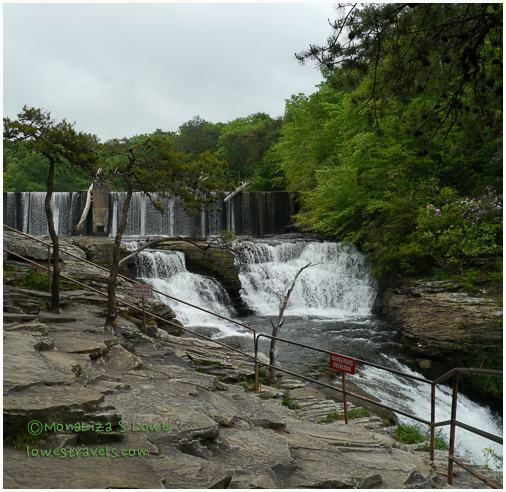 There were other hiking and biking trails to explore beyond our campground at Noccalula Falls. 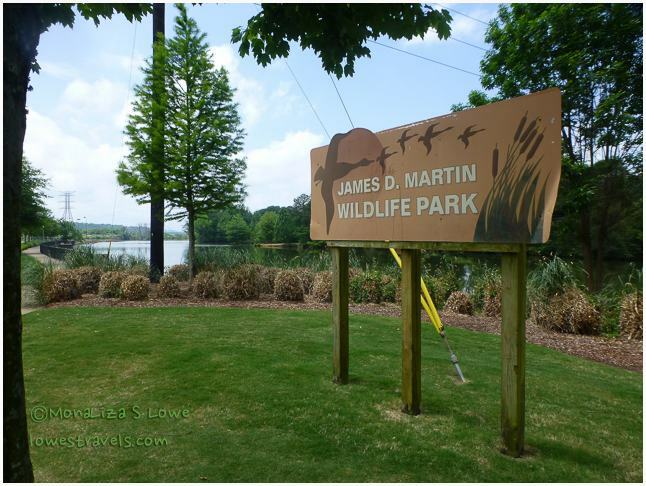 One was the James D. Martin Wildlife Park and Walking Trail. We found it located behind a large shopping mall and thought that was rather strange. 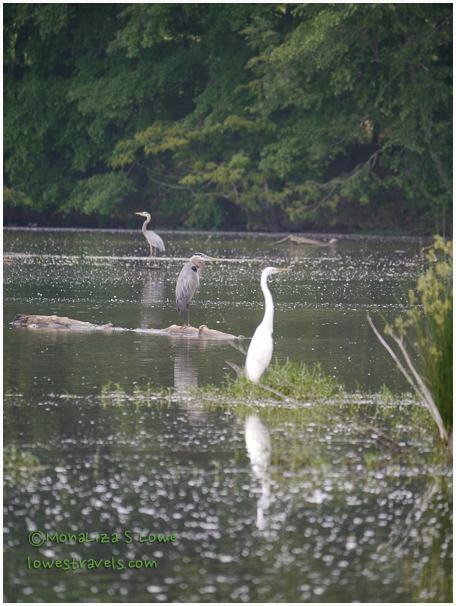 Then we learned that the land bordering the H. Neely Henry Lake is too swampy for commercial use and was set aside as a flood plain and wildlife recreational area. It turned out that we were pleasantly surprised by the two-mile long green trail that also provided a raised network of boardwalks. It allowed us to walk out into a 300-acre lake which provided me with great bird-watching opportunities amongst the wildflowers, were in full bloom. We didn’t think we’d spend much time on this short trek, and since it was overcast when we started, we failed to bring our sunglasses and hats along. We were sorry about that when the sun came blazing out halfway through our enjoyable walk. Biking the Chief Ladiga Trail was also on our must-do list here. 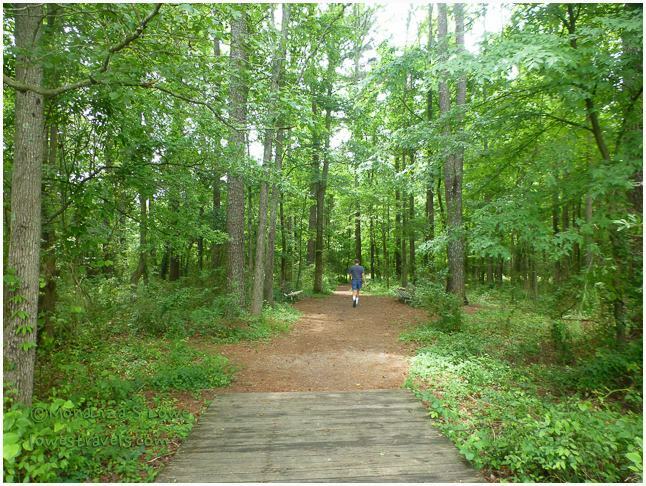 This trail is Alabama’s first extended rails-to-trails project. 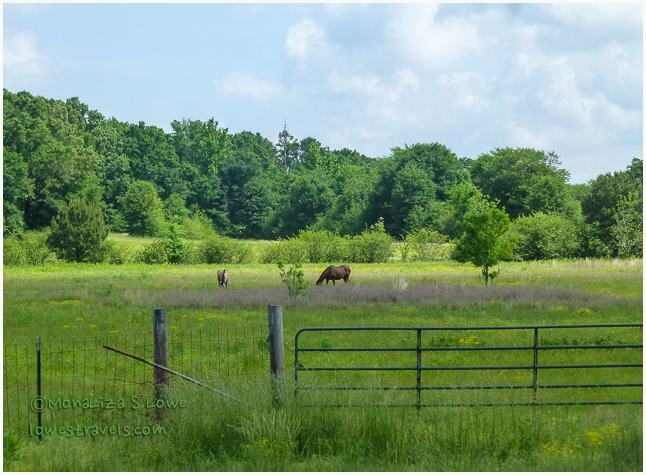 It covers 33 miles through the countryside of Calhoun and Cleburne counties in northeastern Alabama, and ends at the Georgia state border. Although we were off to an early start, it quickly got hot and humid so we clocked only 16 miles on this ride. The rails-to-trails paths are usually paved and offer a maximum of 2-3 degrees of slope at any point, because that’s all the train locomotives could handle at the time. Although not physically challenging, these trails have proven to be a very enjoyable way to leisurely bike on tree-covered paths with lots of bridges and birds singing to us along the way. They often go through several small towns so you can get a real feel for the area, and sometimes even stop for lunch along the way. Not a bad way to spend a half day! Our one-week stay at Noccalula Falls Campground in Gadsden, Alabama was active and outdoorsy, as we enjoyed mostly sunny weather. And that’s how we spent our last few days in Alabama, now onward to Tennessee!